Descrizione: Allow to use a LDAP directory to authenticate users on Piwigo. Descrizione: Provides various ways to sign in your gallery. Descrizione: NoPassword is designed to work conjointly with $conf['apache_authentication']=true. It will refuse to activate unless you have configured your Piwigo instance with $conf['apache_authentication']=true. - Disables the password fields in the user profile page. 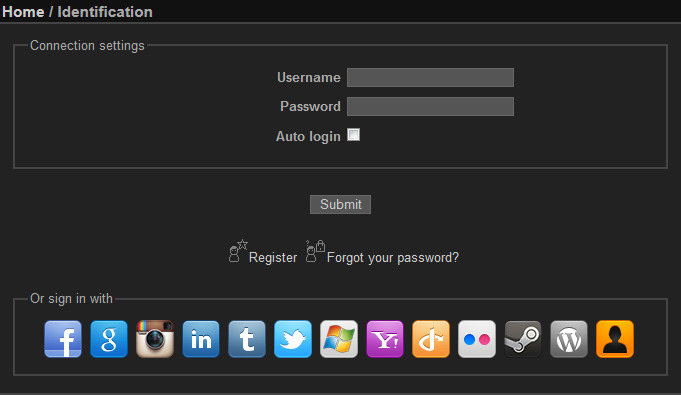 - Disables the password fields in the "Add User" dialog in the "Manager User" admin page. - Disables the "Change Password" button in the user editor from "Manage User"
- Redirects hits from the Identification page to the index. This provides a more consistent experience when using Apache authentication.